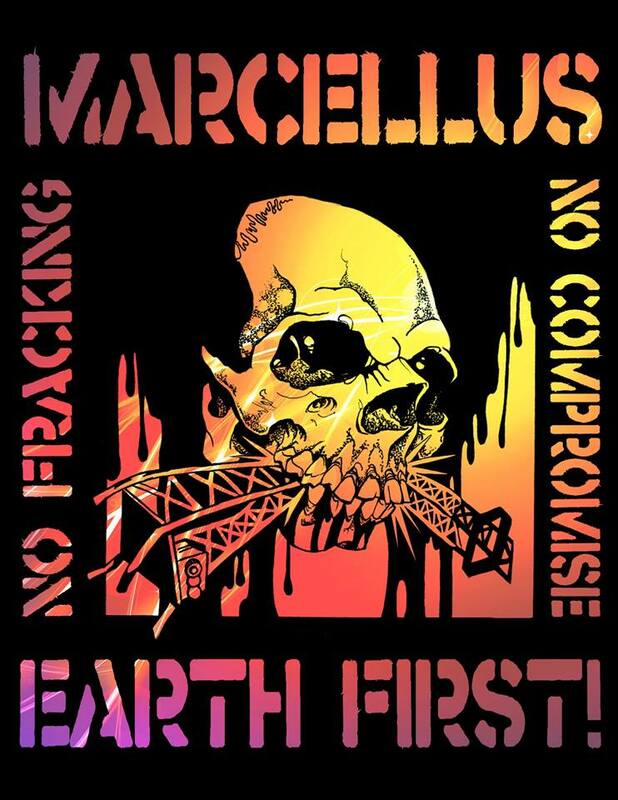 People united under the banner of, Marcellus Shale Earth First! (MSEF! ), whose tagline is, “No Drilling! No Compromise!”, have sworn to defend the Loyalsock forest from Anadarko’s ecocidal ways. On September 13th, two weeks ago today, the first aerial blockade was erected at the site of a proposed well pad. Should Anadarko continue with their plans, activists say there could be many more blockades in this forest. High in the canopy of the forest sits a brave tree sitter on a platform who chooses to identify themselves as Hellbender, the name of the giant salamander of the North East who makes it’s home in the Loyalsock forest. A tree sit like this is a form of direct action in which people use their bodies to directly prevent trees from being cut. This type of action being taken by MSEF! protestors is an example of how communities can directly engage with their oppressor and reclaim their right to be an agent of change when external governing bodies are not only unreliable, but may be under the direct influence of or in cohorts with the oppressor. Current models of organizing, based off of the NGO trope popularized by groups such as the Sierra Club and 350.org, continue to direct their attention towards Washington DC. In just about every article written by Bill McKibben, founder of the $5M/yr. Rockefeller funded, 350.org, McKibben makes some appeal for Obama to “make the right decision.” This kind of blind faith (or carefully calculated wording) urges followers of McKibben to continue to invest in a power structure rooted in patriarchy, white supremacy, and capitalism; the perfect conditions to ensure that projects like the destruction of the Loyalsock forest, and other commodifications of the earth, continue. Many people living in communities in Pennsylvania that are being directly impacted by the hydraulic fracturing company know that they cannot wait for Obama to, “make the right decision”, or spend all of their time encouraging him or other politicians to. At the only public hearing that was held about the decision to frack in the Loyalsock forest, MSEF! called out members of the Department of Conservation and Natural Resources that they identified as being complicit in this state sanctioned ecocide. Over 350,000 fracking wells have been drilled in Pennsylvania and countless ecosystems have been disrupted. In addition, people who live in places where frack wells have been developed have experienced a range of drilling-related health impacts including headaches, dizziness, skin rashes, eye irritation, and breathing problems. Well water has been poisoned, farms have been rendered incapable of sustaining animal and plant life, and many fear that fracking earthquakes, like the 109 that were proven to be directly linked to ground injection of wastewater from fracking projects in Youngstown, Ohio, will begin to rock Pennsylvania. Communities know that they cannot wait for the government to protect them. Last July (2012) MSEF! engaged in the first ever shut down of a fracking well pad in the so-called “United States” utilizing the tactics of tree sits, lockdowns, and slash piles. The blockade, in the Moshannon State Forest, received international support as well as local support with reports of people from neighboring farms delivering cases of bottled water and bundles of fresh picked blueberries to the blockaders whom they thanked profusely for their actions. The science is in, fracking is extremely dangerous for the environment and for animals, including human beings. Esteemed academics such as engineer Dr. Tony Ingraffea of Cornell University, have done extensive research to prove this. Communities in Pennsylvania are being left high and dry –literally, when drinking wells are frequently being poisoned— by the governing bodies who are supposed to protect them. Because many NGO’s “leading” the mainstream environmental movement continue to operate within a context that focuses on the more privileged segments of society and invests in power structures who have failed to protect the people or earth, communities on the frontlines being most impacted by the environmental degradation caused by fracking are not getting the support that they need. Frontline communities are often those that are caught more directly in the crosshairs of oppressive systems and therefore typically lack class, race, gender, and citizenship privileges.